Published on September 20, 2011,	by Jason in Cambridge Alert Network. The City of Cambridge is excited to announce the launch of the Cambridge Alert Network, a new and improved notification system aimed at sharing information with community members in an effective and timely manner via phone, text and email. 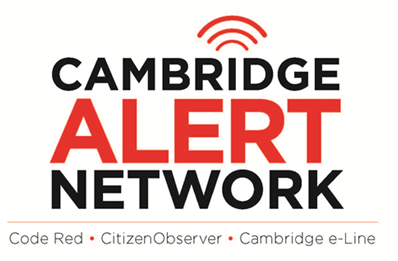 The Cambridge Alert Network currently consists of three services: CodeRED, CitizenObserver and Cambridge E-Line. CodeRED is an emergency notification system that allows the City to send emergency notifications to subscribers via email, text and phone calls. Cambridge land lines will automatically receive emergency notifications by phone, but all are encouraged to sign up with their cell phone number and email addresses as well. This service will be used in the event of emergencies affecting the City, such as snow emergencies, evacuations, large-scale water outages or other significant service disruptions. CitizenObserver is used by the Cambridge Police Department to send email and text alerts relating to crime. All are encouraged to subscribe to receive neighborhood–specific alerts about emerging crime patterns, announcements about neighborhood meetings and crime-prevention tips. Cambridge E-Line is a source for general information and communications from the City of Cambridge via email and text. Anyone can sign up for street cleaning reminders, trash and recycling pickup, City news and departmental information. Please visit www.CambridgeMA.gov/AlertNetwork and sign up today. Questions, concerns or help with registration should be directed to 617-349-9490.